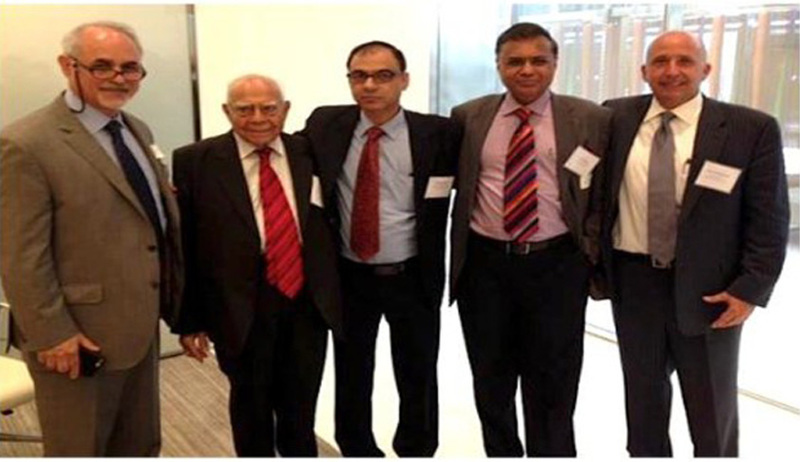 Indian National Bar Association (INBA) Delegates, Prominent U.S. Law Firms and Iconic Indian Jurist Ram Jethmalani tackle hotly debated topics during Washington, DC and New York City Visits at U.S. India Business Council Conference this year. Twenty INBA members based in India will now be returning home to figure out next steps after many animated presentations and conversations in Washington and New York City last week, all topics swirling around growing speculation that India will soon open its doors further to expanding law practice by foreign lawyers. A special meeting between a select INBA contingent and the American Bar Association (ABA) in Washington, DC also made headway, putting together an agenda, for increased cooperation between the ABA and INBA. INBA invited the ABA to cooperate in the opening of the two markets. The two conferences and two receptions in both cities featured representatives from the U.S. India Business Council (USIBC), former Law Minister Ram Jethmalani, INBA Secretary General Kaviraj Singh, N G Khaitan of Khaitan& Co., INBA General Counsel Section Chairman Shri Ram Ramaswamy and participating law firms including: Covington & Burling (sponsor), Hodgson Russ (sponsor), Dentons (sponsor), Crowell Morning, Pepper Hamilton (sponsor), Baker Hostetler, and a number of other counsel and business representatives, such as attorney and CEO of Capital Novus DharmeshSingala, attorney James Duffy, CEO Gerard Chambers of GLC Business Services (sponsor), attorney Vishal Gandhi of Gandhi & Associates and Law Practice Advisory Group CEO Michael Blanchard. U.S. Congress and government officials were also present along with USIBC VP Diane Ferrell, who introduced the Washington conference. Approximately one-hundred-and thirty attendees interacted in both cities to learn each other’s opinions and the latest about so-called “Black Money,” cross border law practice, the Foreign Account Tax Compliance Act (FACTA), corruption, M & A, intellectual property issues and doing business in the U.S. and India. The successful INBA delegation is the first of its kind and was coordinated by USIBC and Media & Communications Strategies (the INBA U.S. public relations and legal business exchange agency-of-record). The most heated discussion during the conferences, which also attracted international news attention, was triggered by Mr. Jethmalani’s urging the U.S. to assist India, and to bring back the significant amount of black money hidden at various overseas sheltered locations. Mr. Jethmalani said that the US has access to the information and lists of names of Indians who have black money in Swiss banks. Mr. Jethmalani congratulated the U.S.’s current efforts to prosecute black money tax evaders and said the U.S. should assist India by sharing the names of those Indian nationals involved in hiding money. INBA’s Secretary General - Mr. Kaviraj Singh had a glowing evaluation of this first delegation and promises there will be more trips and activities that will encourage market penetration and legal interaction between the two countries. Mr. Singh also attended World Yoga Day activities in New York City at the special invitation of United Nations officials. “INBA’s successful delegation at the conference in New York and Washington prove that the two countries’ legal and business communities are very eager to expand their relationships and find mutually beneficial avenues for communicating to get business done. There is no doubt law firm client’s want these doors opened and we will find ways to follow client’s business interests,” said INBA’s Secretary General Mr. Kaviraj Singh. A number of the U.S. law firm and business representatives at the conference promise to visit India, possibly during next November’s INBA Law Day event. U.S. and Indian business representatives at the conferences are in preliminary discussions now about market penetration and raising marketing and public relations visibility in both countries. Media & Communications Strategies, Inc. is facilitating those kinds of interactions. Michael Blanchard, a law firm business strategy and management consultant with Law Practice Advisory Group LLC, will assist in this effort by providing US law firms with targeted development opportunities for transactional and institutional relationships to increase or enrich representation capabilities for clients who wish to invest or expand their presence in India business markets through access to pre-qualified India based law firms and legal services providers, as well as, connect US law firms with general counsel of India based corporations looking to invest or expand their industry sector presence in US markets, both regionally and nationally.